The former President supported soft borders with India in Kashmir. But he was also soft on the extremist elements that threaten the security of India, and now Pakistan too. It is a testimony to the contradictory legacy of Pervez Musharraf that his departure from the President’s office in Islamabad should occasion joy in Pakistan but a sense of unease within the Indian establishment. Reviled at home as an enemy of democracy, the former commando managed to genuinely perplex his interlocutors in India. If his advocacy of a new political approach towards the Kashmir issue opened the door to the most promising dialogue the two countries have had in the past six decades, his refusal to abandon the extremist ‘assets’ that the Pakistani military had built up during the long years of officially-sponsored ‘jihad’ always remained a latent point of concern in New Delhi. Architect of the notorious Kargil misadventure of 1999, the retired General Musharraf subsequently emerged as one of the most vocal advocates of ‘out of the box’ thinking as far as Pakistan’s attitude towards Jammu and Kashmir was concerned. His idea of negating solutions the other side found unacceptable — first unveiled at the failed Agra summit of 2001 — was eventually reciprocated and modified by the Indian side to produce what has since become known as the ‘soft borders’ formula. Endorsed by both Prime Minister Manmohan Singh and Gen. Musharraf when he was President, the fate of this approach is surely under question today. Not only is Islamabad’s commitment to the formula uncertain in the post-Musharraf era, but recent events in J&K — and in particular the valley — have thrown into serious doubt the Indian government’s ability to use this approach towards the resolution of the state’s troubles. In a sense, the architect of the new approach and the political terrain on which the approach was to be implemented have both disappeared at more or less the same time. The revival of a mass movement in Kashmir in favour of azadi and even accession to Pakistan will certainly reduce whatever appetite still remains within the Pakistani military establishment for the Musharraf formula. And given the heady spirit in the valley, how likely is it that people there will want to settle for soft borders within the territorial status quo when their leaders are once again dangling before them the prospect of self-determination? What makes the current vacuum particularly troublesome for New Delhi is the impact the exit of Gen. Musharraf coupled with the ongoing turmoil might have on the revival of extremist violence in Kashmir. For an equally important part of Gen. Musharraf’s legacy apart from the discourse on ‘making borders irrelevant’ is the ready presence of insurgency infrastructure that can be used as and when the circumstances warrant it. This duality — or duplicity, depending on your point of view — vis-À-vis Kashmir has meant the preservation of subterranean ties between the military establishment and a whole range of human assets whose onward linkages and activities the military has not always been able to control. Whether prompted by strategic considerations or domestic political compulsions, Gen. Musharraf also replicated this duality on Pakistan’s Afghan border, much to the consternation of the Pentagon. It is this duality which allowed Gen. Musharraf’s slogan of ‘enlightened moderation’ to coexist with the violent pronouncements of a Masood Azhar or a Hafiz Mohammed Saeed. It is this duality which led to the multiple attempts on the former General’s life and to the spate of terrorist attacks on the Pakistani military across the country. And it is this duality which has led to the spectre of the ‘Pakistani Taliban’ which now haunts the citizens of that country in the North West Frontier Province and elsewhere. The departure of President Musharraf does not mark the end of this duality. What Pakistan saw on Monday was the departure of a civilian President, effected with the concurrence of a military leadership that finds itself at a cross-roads and has shown a willingness to take the first tentative step forward in the right direction. If he wants, General Ashfaq Kayani can keep moving along this path. If he wants, he can put an end to the underground politics of jihadism once and for all. This is what America is demanding, this is what India would like and this is what Pakistan needs. Is there a constituency within Pakistan for such a radical course correction? There is. But the equation is complicated by the insensitive and heavy-handed manner in which the United States has conducted military operations inside Afghanistan and also on Pakistani territory, leading to the loss of innocent civilian lives. 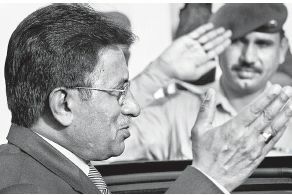 Over the years, this led to a contradictory situation where Gen. Musharraf was seen as an agent fighting America’s war, even as American officials were questioning the sincerity of his commitment to the ‘war on terror.’ Equally contradictorily, Washington continued to back him as President despite the games he was playing because it feared a civilian government might be even less amenable to taking on the extremists. Gen. Musharraf’s painless exit suggests a way has been found to square the circle and that the army leadership in Rawalpindi will continue to cooperate with the Pentagon regardless of the resentment which exists on the Pakistani street. But in the long term, this strategy can work only if the military is ready to give up its political ambitions and ‘normalise’ itself as a responsible institution of a democratic state. From India’s point of view, there is no reason to fret about whether the new rulers of Pakistan will continue with the positive aspect of Gen. Musharraf’s Kashmir policy or not. As Pakistan stabilises and normalises — and it is essential for its survival that it does — this is the golden mean towards which it will always gravitate. For the moment, however, it is the broken pieces of New Delhi’s own half-baked Kashmir policy that urgently need gathering. with the resignation of Mr. Musharraf from the presidency, will the Pakistan Government change its stance on India’s Nuclear Deal. This entry was posted on August 20, 2008 by Siddharth Varadarajan in Indian Foreign Policy, Kashmir, Pakistan.